What are the roles and accountabilities that Māori take on in relation to sustainable environmental practices? How do a selected number of these function; what are the aspirations, intentions, processes, relationship and actions involved? What are the challenges and facilitators (enhancers and barriers)? What works well; what can we learn that could be applied more broadly? Research about Māori views and mātauranga of the environment have begun to be explored by scholars, however much less is known of Māori specific views about options for achieving the government’s target of New Zealand becoming ‘predator free’ by 2050. Given the huge groundswell of nationwide public support for this drive, it is critical to explore Māori ways of being and doing ‘predator-free’. This NPM platform project uses a specific case study to examine in more detail the nuances and variation of views, solutions and agency within one hapū and their interaction with government. The questions for this project support the Te Tai Ao platform by providing detailed examples of solutions to the challenging issue of pests, their control and their detrimental impact on Indigenous flora and fauna. Horohoro maunga is located 12 km south of Rotorua in the Bay of Plenty region. Ngāti Kea/Ngāti Tuara hold manawhenua in the area and Kearoa marae is located around 2km from the base of the mountain. Ngati Kea/Ngātu Tuara once held mana whenua over approximately 50,000 acres of land, west to Tokoroa, north to Rotorua and south to Atiamuri. The hapū now has only 4,000 acres in total, with 1,100 acres being made up of land on Horohoro mountain. The mountain has farms at its base on the east side. At the south and west is Department of Conservation land, including the Mōkaihāhā Ecological Reserve where kokako are found. In 1974 the hapū established the Horohoro Bush and Mountain Reserve as a Māori Reservation with the aim of protecting and restoring the native fauna and flora and protecting this site which has significant cultural and historical importance. 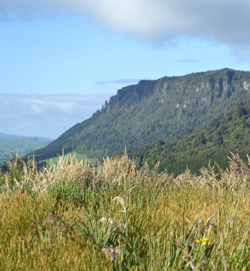 Although Horohoro maunga is a Māori Reservation, the hapū face a challenge monitoring the flora and fauna as well as the human presence on the mountain, with hunters often accessing the mountain from surrounding farms without permission. Recent trapping also suggests explosive numbers of pests: stoats, ferrets, possums and rats on the mountain, hindering the ability of native species to flourish. This presents the hapū with a challenge to consider how to be active kaitiaki and revive the forest and birdsong of Horohoro maunga. This platform project will follow a case-study approach and provide a valuable collation of knowledge to address the broader collective aspirations of this platform programme of research. The specific focus of this research will also assist in considering a much broader question about the contributions that Māori are entitled to make as tangata whenua in Aotearoa to the categorisation and decision-making of ‘problems’ and ‘solutions’ in science and environmental contexts.